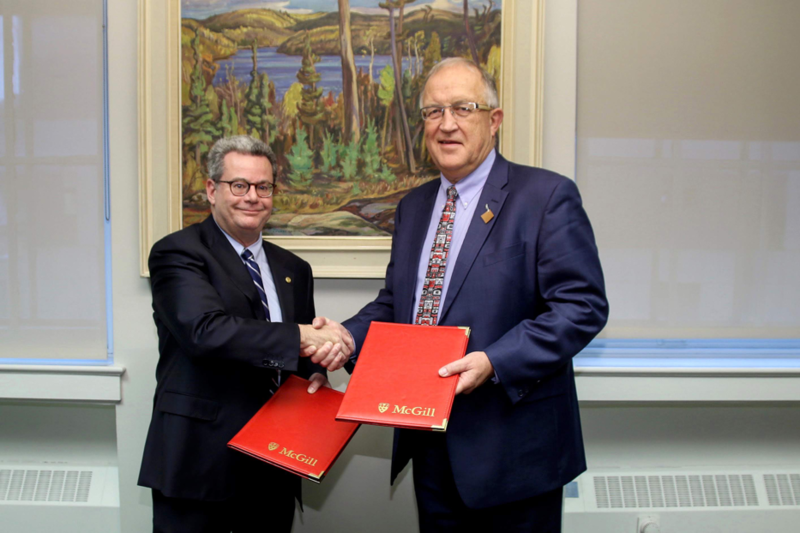 Vancouver Island University and McGill University sign a Memorandum of Understanding (MOU) to explore how the institutions can work together to engage in research and academic exchanges for faculty and students in Indigenous education and Indigenous studies. A deep and shared commitment to supporting the recommendations of Canada’s Truth and Reconciliation Commission (TRC) have led McGill University and Vancouver Island University (VIU) to form a unique collaboration to create new opportunities in Indigenous studies. On Monday, October 15, 2018, Prof. Christopher Manfredi, Provost and Vice-Principal Academic, McGill University, and Dr. Ralph Nilson, President and Vice-Chancellor of VIU, signed a Memorandum of Understanding (MOU) agreeing to explore how the universities can work together to further support research and learning in the areas of Indigenous education and Indigenous studies. “By working together, we can build bridges and learn from our different experiences. McGill shares VIU’s commitment to Indigenous success and to the support and promotion of Indigenous scholarship and pedagogies; I look forward to seeing this important collaboration develop,” said Manfredi. According to the MOU, a working group consisting of representatives from both universities and Indigenous communities will be formed to discuss how the institutions can best collaborate. co-sponsoring seminars and academic and community engaged meetings related to these fields of study and the highlight the benefits of the work with indigenous communities. The MOU sets out a collaboration period of five years, at which point the institutions will review the progress they have made and decide on how to best move forward to support this important work. Photo Caption: Prof. Christopher Manfredi, Provost and Vice-Principal (Academic), McGill University, and Dr. Ralph Nilson, President and Vice-Chancellor, Vancouver Island University, sign a memorandum of understanding outlining their joint commitment to collaborate on a variety of activities and initiatives in the fields of Indigenous Education and Studies.